Nationalities subject to visa : citizens of all other nationalities can obtain their visa in embassies. Note: a passenger who does not have Central African identity papers (passport or identity card) is considered as a foreign passenger even if he / she has a multi-citizenship and must therefore be in possession of a visa . Standard procedure in embassies: You can go to the nearest Central African diplomatic representation accompanied by the necessary documents. For information, a visa for a French citizen residing in France costs 75 €. Travelers living in a country without a Central African diplomatic representation can obtain an visa on arrival on condition that an express authorization has been requested in advance. 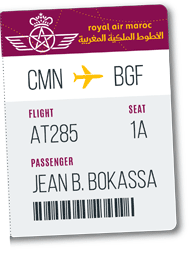 Passengers with no visa are sanctioned by a fine of 200,000 FCFA (300 €).